Before I start ranting about the amazing episodes 19 and 20, I have to say that I’m proud to see this drama scored a rating of 19.5% for the 20th episode! I was checking the ratings in my class yesterday and the news totally made my day. Sometimes, ratings isn’t the only benchmark to determine how good a drama is, but it does matter to some people. This drama totally deserves that high ratings. I’m hoping to see it rises for the upcoming episodes! Okay, back to the main point…the rant. I totally had a great time watching the first scene in episode 19, which was the continuation of the execution in episode 18. The fake Gaksital was indeed the comrade (RIP) and as soon as Shunji was relieved for half a second, for he thought that Gaksital had died, the real Gaksital showed up. Remember my argument about Kangto wasn’t the first Gaksital? …though this time, he’s ditching his treasured flute and opted for a sword and a few daggers. He’s well-prepared indeed. However, I’d still consider Kangto super lucky this time as Shunji’s bullets nearly hit him, if not for his injuries from the bomb and he’s shooting like a drunkard..too angry maybe? It looks like Shunji had been practicing with his shots. If not, how could he shot two persons to death last episode and injured another one in this episode? That’s quite an achievement on his side, but I’m not sure if I have to be proud of him…maybe not. 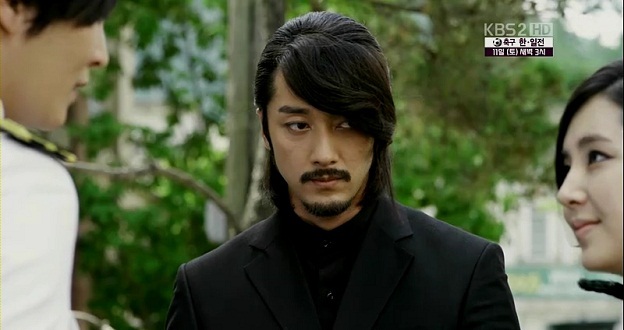 It’s about time for Shunji to ‘inherit’ that honorable title once bestowed upon Kangto: the Spirit from Hell. I realized that my love for him is decreasing day by day and his chance to return to his old self was getting slimmer each time he did something nasty just for the sake of finding out about Gaksital. I couldn’t watch the scene where he tortured Jeok Pa. He looked so out of his mind, stepping out of his boundary. I really hate to make any prediction about the ending but at this point alone, there’s no turning back for him. If there’s any, he’d need a very strong reason to do so and for now, there’s none. So it’s safe to assure myself that he’s gone too far….ah, Shunji! If there’s one thing I should be thankful to Shunji, it’s for him collapsing and admitted to the hospital. Thanks to him, Kangto and Mok-Dan got to meet and stare into each other’s eyes, even for a brief moment. I have to admit that I got too excited during this scene and burst into tears. It’s such a short but powerful scene, at least for me. Mok-Dan’s trying hard not to break into a smile and Kangto looked so relieved. The unsaid words…I can’t. even. squeal. *speechless* That holding hands was super sweet of Kangto, but also very dangerous. I could never trust Shunji, even with his eyes closed. Although there isn’t that much scene of Mok-Dan in episode 19, she showed that she’s slowly changing, from a hot-headed and careless girl to someone who thinks about the consequences before making a move. Before this, she’s acting on impulse without thinking about anything, even for her own safety. She’d just do whatever she thought necessary, fearlessly challenging people against her. But now, she finally takes some time to ponder about the effects of her action to the people around her, especially Kangto. I’ll miss everything about you: your kindness, your bickering with Wada, your lack of sense of humor, your promises to Kangto. It’s hard for me to accept the fact that he’s dead, because I was hoping for him to be one of Kangto’s supporters and also the one who would be strongly against the Kishoukai. But suddenly…he’s gone. Forever. Why there were so many people dying in this episode?! And the Kishoukai scoring so many important posts in the government…I’m not that happy with it. 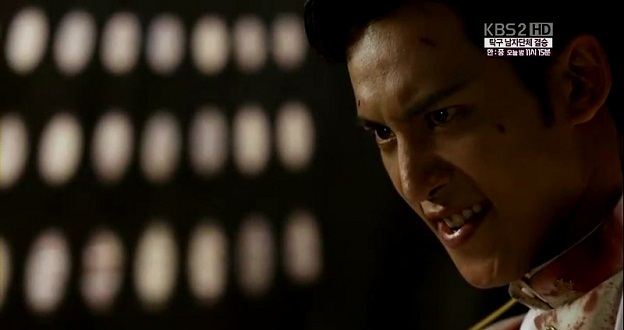 Especially that I had to see Taro smiling smugly and the new Police Chief’s allergy towards the Joseon people. The only Kishoukai member that I like so far is only Rie. Oh, I have to add Katsuyama too, because they’re a set. Am I the only one who’s excited for Rie’s very own development arc? I’ve seen so little of her and she remained the most mysterious character in the drama. Kangto leeching off her to infiltrate Kishoukai was one dangerous step, enough to be a suicide mission for him but luckily, I got to see Rie’s true nature in front of the man she loves. No matter how hard she tried to be strong and upright, she couldn’t hold herself properly in front of Kangto. Oh, Rie…you’re so in love with him! I really wish to see Rie’s back story, because the only thing known about her is her past as a gisaeng. No one knows about her true intention, the reason why she joined Kishoukai. Maybe she wanted to get the recognition from the people who once stepped on her, but she definitely had an ulterior motive. The way she praised Kangto’s dream suggested that she’s ambitious, but that’s all. I’m really curious about her! I totally didn’t blame her for being so infatuated with Kangto. Well, who wouldn’t fall for such a badass guy? In her eyes, he’s ambitious like her and their meeting five years back seems to be a fate that brought them together. But this is a drama after all, and her love would remain one-sided till the end. I dare to say that Rie’s like a female version of Kangto. They might have different experience, but they’re both Koreans who served Japan. They would be able to realte and to understand each other; what they have faced, what they have done in order to reach their current positions. It wasn’t pretty at all (I’m pretty sure about that), the road to their ‘success’ but I could see them relating to each other, connecting through mutual understanding. Rie’s love towards Kangto might be influenced by this, as she saw him as the only guy she could relate to and the only one who would understand her ambitions. This was one of the best scenes in episode 20: from their conversation to Rie’s inner conflict. Kangto’s words that she thought were pure lies started to get back on her as soon as she found out that he’s the real Gaksital. One thing that made me love Rie even more was when she rolled down Kangto’s sleeve instead of leaving it just like that. To me, it’s a sign that she’s already started to protect him in her very own way and she’s keeping the fact from everyone but herself, but at the same time refused to admit it even to herself. You’re sure one conflicted soul, Rie. Don’t worry, Katsuyama is always there for you. Watching episode 20, that was the first time for me to read recaps before I watch the episode. 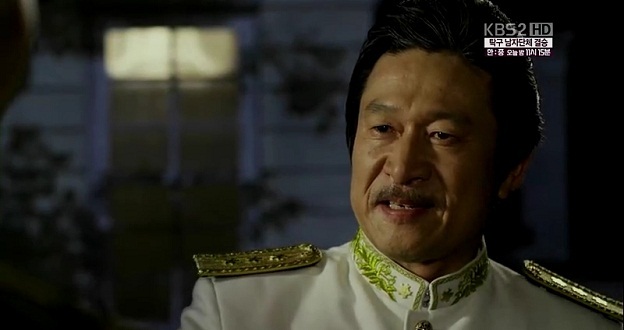 It’s simply because I found that the new chief Murayama was grating on my nerves each time he appeared on the screen. Probably because he’s hating Kangto so much until I felt his hate was too much. Aish. It’s like having his fate turned upside down when he’s deemed fit to be the Police Chief by Konno, but then demoted to the lowest rank by Murayama. And on top of that, the annoying Goiso took his place. What?? I couldn’t accept it!! Those two annoyed me so much until I started to wonder whether they’re somehow related to each other. Urgh. Guess I should stay away from both Goiso and Murayama…haa..
Shunji’s joining this annoying police gang too. He started to suspect Kangto again for being Gaksital after hearing about Kenji killed Kangto’s mother. He’s supposed to be apologetic but nope, he didn’t. In fact, he kept Kangto near him in order for him to check on Kangto easily. You’re really evil, Shunji. I dare to say that there isn’t an ounce of kindness left in that dark heart of yours. Especially when you started to talk about Kangto’s family like they’re insignificant for you. You’ve came a long way since the first time I saw you as Teacher Shunji. Thanks to you too, these two need to stay undercover. Apart from driving me into a mess, this scene was shot beautifully. The camera focused on Kangto and Mok-Dan’s hands but Shunji’s also there in the frame, although blurry. 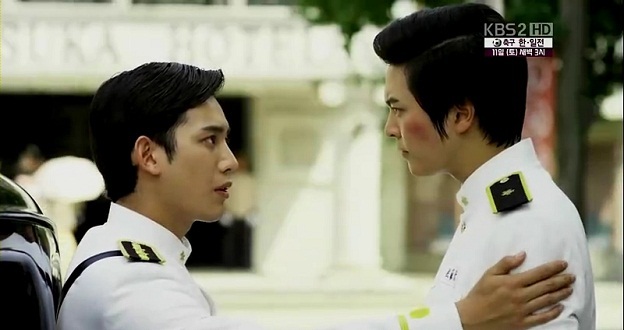 Ironically, their relationship, in reality, is hidden and Shunji as the threat for both of them is the evident one. Can’t they just run away from all these problems for a while? Maybe not. Gaksital, the mask that gives the wearer a very big responsibility. 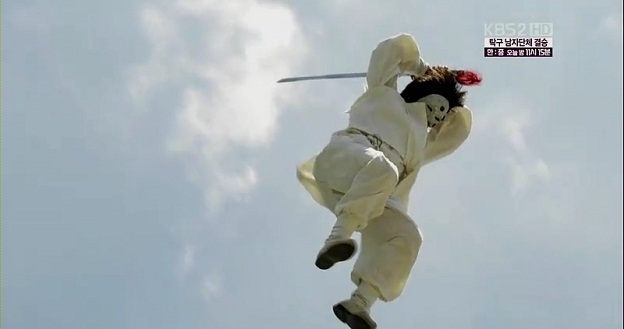 How could Kangto leave everything behind, when he’s Gaksital: the only light and hope to Joseon’s darkness? Gaksital must live, so I hope I can trust Rie this time. i love this drama,,rie knows Lee kang to is gaksital,, OMG.. i can’t breath.. I don’t have idea what will be rie do to Lee kang to..